While logical thoughts are created in your head the truth of any scenario always comes from the gut. This is the biggest 'unspoken' weapon we've ever had for 'out smarting' and detecting the presence of an astute creature that can return thousands of miles to its natal stream via only the earth's magnetic field and it's highly tuned nostrils! Take a close look at this perfect 'halfway house' River Tay salmon 'stopper' on the Dunkeld House beat that they call the Chestnut Tree Pool. Don't study the beautiful easily spun riverbank but instead gaze deeply into the perfect dark slow paced holding water and then try to bring your gut into play by imagining the presence of Salmo Salar. If you're properly connected to this game and study any salmon pool long enough you should start to see the entire riverbed and the suspected holding positions of salmon whether you care to admit it or not. Other salmon fishers will understand this but just don't tell your doctor! Gut feelings in salmon fishing works 2 ways and the 1st is on what fly or lure to use when setting up your rod in the morning. The 2nd is that gut endorsement to stick with that proven fly or lure when salmon seem not to be cooperating based on the fact that you've seen this many times before and often only minutes before a fish shows up! There's strange things that happen on a salmon river and overthinking or willing a fish to take are guaranteed to back fire on you. Switching off all feelings of urgency but staying consistent in your approach and even letting your mind wander a little seems to without doubt be the winning formula! I've watched the Scottish rivers and studied the behavioural patterns of salmon long enough to make me think that we're the ones that are not as fully tuned in to our gut feelings compared to our silver colleagues. 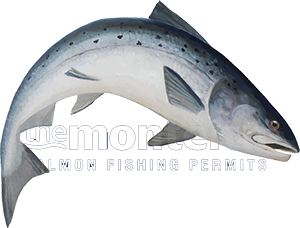 A salmon knows in advance when its ready to run a river and even the slightest smell of fresh water (& well before any water gauge reading starts to budge) that fish will be on the move. Salmon can also detect exactly when your mind has 'drifted' and if you study the salmon takes you receive throughout the fishing season you'll notice that they are all 'mysteriously' timed to perfection! As a former River Tay boatman I used to completely cringe when any fishing guests starting mouthing careless words like 'come on fish' from the boat knowing fine well that they'd just 'death sentenced' the entire fishing day effort. I never recall a salmon being caught on any day I ever heard these words used which clearly were a huge 'siren' of over eagerness on the angler's behalf that should have been kept well hidden from a salmons ESP and kept in a Kevlar wrap in the back of their mind! If you spend enough time on a salmon river pursuing these special creatures you'll realise what I've just mentioned is overly accurate information. The key to successful salmon fishing is firstly knowing exactly how to optimise your salmon fly or lure water coverage via thoughtful riverbank cast spacings. Notice I didn't say launching a 40+ yard cast out across the river as that has little to do with catching a salmon so let your 'real' fishing thoughts click into gear the split second your 'controlled' fly or lure enters the surface of the river. The other key point I'm trying to make here is to stay under the radar after you're fishing well and disengage all thoughts of hooking a salmon and instead just periodically self check your form and stick with it. You'll be amazed if you focus on quality water coverage and drop the over eagerness to hook a fish how salmon will all of a sudden be much more attracted to you!